2 Bedroom For Sale in South Petherton for Asking Price £325,000. 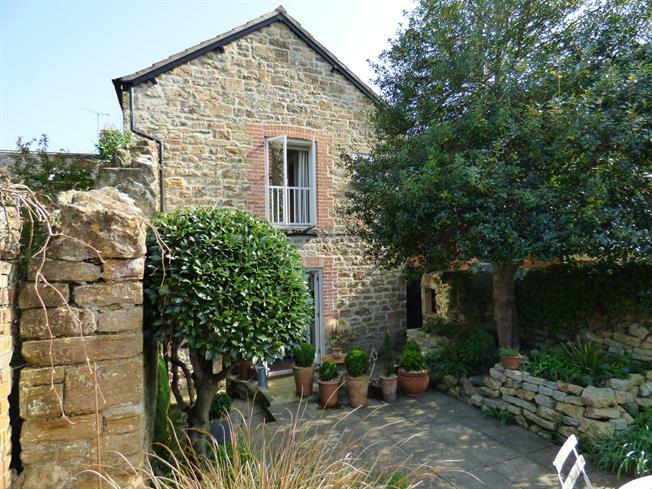 Offered with no onward chain, this delightful and sensitively restored cottage is located in the centre of the village, peacefully hidden away on a quaint footpath, yet just around the corner from all the shops. A very important feature is the completely private walled garden, measuring about 56 by 20 feet. The ground floor: the Kitchen/Dining Room opens out via French Doors to a paved outdoor eating area; and the cosy Living Room has a fireplace with a log/multi-fuel stove. The first floor: two Double Bedrooms, separated by a Study/Sitting Room with views over the rooftops of the village. One Bedroom has a dramatic vaulted ceiling and adjacent Bathroom, the other has an en-suite Shower Room and Juliet balcony which overlooks the garden. Adjacent to the cottage is a circa 200 sq. Ft Workshop/Studio with an additional garden. This is a property that must be viewed to fully appreciate not only the high standard of internal finish but also the beautifully secluded nature of the garden. Deep Belfast sink, plumbing for washing machine and dishwasher, wall mounted gas fired combi-boiler, double French Doors to garden, built in electric hob and oven. Bamboo wood work surfaces with shelving under, large shelving unit/dresser to one wall, exposed beams. Radiator, open tread staircase off, two windows, fireplace with woodburning/multi-fuel stove. Curtained wardrobe space, Juliet Balcony with double, full height windows, radiator. Low level WC, walk in double shower with glass sliding door, pedestal wash hand basin, tiled floor, window, towel radiator. Electric underfloor heating. Vaulted ceiling with exposed beams, double height curtained wardrobe space, two windows, radiator. Pedestal wash hand basin, low level WC, tiled floor, window, panelled bath with hand grips, mixer shower unit over. Towel radiator. Part tiled walls. Electric underfloor heating. Two doors, single phase 60amp electricity, lighting, water and drainage with Belfast sink. Further garden area with flower borders, ornamental shrubs and trees. Large, secluded walled garden, well established with ornamental trees, shrubs, flower beds, wide paved patio area, greenhouse, brick and flag patio area, stone walling, pedestrian access gate to side.